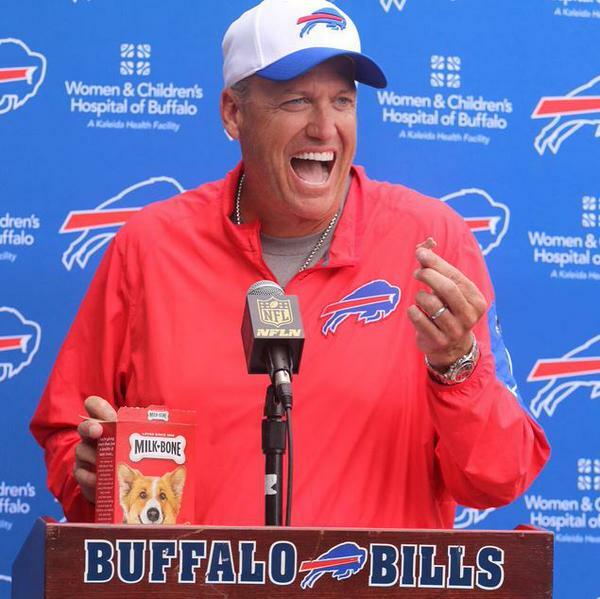 Buffalo Bills head coach Rex Ryan accepted the Dog Biscuit Challenge on Thursday and in the process, probably performed a first in NFL history. Ryan ate a pair of dog biscuits in support of the Society for Prevention of Cruelty to Animals (SPCA). After downing the first treat, he was not done. In the annals of NFL history, has any head coach actually eaten dog biscuits before? What about long-time Giants coach Steve Owen? It’s highly unlikely that anyone went where Ryan did on Thursday in Buffalo. He wasn’t alone though. Bills owner Terry Pegula also chowed down on a dog biscuit. When was the last time Jeffrey Lurie or Bob Kraft ate a biscuit? Half past never? How about Jerry Jones or the late Washington Redskins owner George Preston Marshall? I’m not sure what is going to happen in Buffalo this season but so far so good. Plus, if there is one thing we know about Rex Ryan, it’s that the man likes his snacks.